Light weights effectively target smaller muscles. Traditional gym exercises and machines focus on only one muscle group at a time and often just the large, showy ones, such as your biceps, pecs, quadriceps and glutes. However, light dumbbells allow you to target smaller muscles, like your gluteus medius, posterior deltoids and adductors. Light dumbbell multi-muscle workouts have the potential to improve your functional fitness, endurance, strength and overall muscle tone. The American College of Sports Medicine recommends using isometric, eccentric and concentric movements in multi-joint and multi-muscle exercises. Design your own workouts by combining traditional strength exercises, such as lunges with deltoid lifts, deadlifts with triceps kickbacks or single-leg squats with side arm raises. 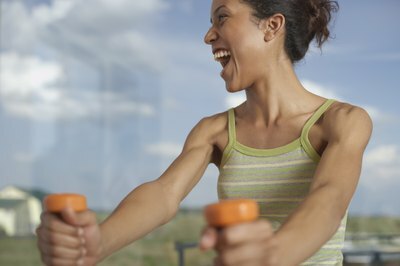 Exercises that incorporate more muscle groups into each move burn more calories during and after the workout than single-muscle exercises. Isolating smaller, oft-neglected muscle groups, requires non-traditional exercises or traditional exercises performed at different angles. For example, your adductors, located along your inner thighs, receive little attention. However, you can isolate them by lying on your side with your head in your hands, legs straight and the bottom leg slightly in front of the top leg, so your inner thigh faces the ceiling. Rest a light dumbbell on your lower leg and raise and lower it or draw small circles with your toe. Repeat on the other side. 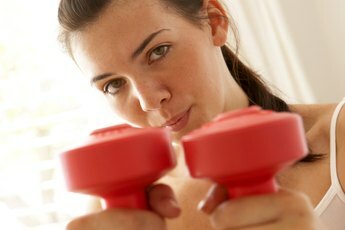 Increase the resistance of light dumbbells by adding the weight of your body. 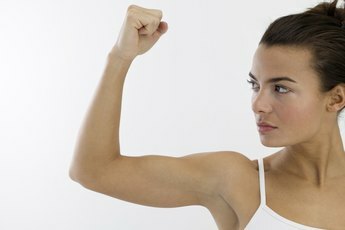 Your arms weigh a lot more than you think. You'll notice it especially after you've performed 30 seconds of frontal arm raises with light dumbbells or small arm circles to the side. Couple the weight of light dumbbells with your body weight in other traditional exercises, such as crunches or glute bridges with the weight on either your chest or your hips, respectively. Perform each exercise until you reach muscle exhaustion, which will be a different number of repetitions depending on the size and strength of the muscles used. Ultimately, you are the only person who can gauge how hard you’re working and whether you’re pushing yourself to the limit. Typically, exercises performed with light dumbbells allow you to complete significantly more repetitions, as many as 30 per set. Controversy swirls around whether light-dumbbell resistance training improves muscle tone and strength. 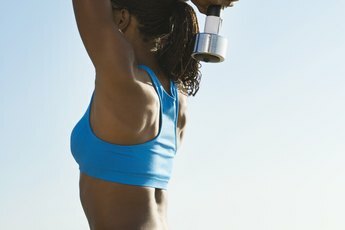 Contemporary fitness professionals dismiss training with light dumbbells as outdated and advise women to lift heavy weights with fewer repetitions. However, celebrity trainer and creator of the fitness DVD program "Metamorphosis" Tracy Anderson advises women to use light weights, no more than three pounds, to avoid bulking up. Science lends some support to her theory. The “European Journal of Applied Physiology” published a study in November 2002 that found using lighter weight with 20 to 28 repetitions increased endurance and strength without increasing muscle size. Tracy Anderson Method: Why Metamorphosis?